Last Saturday at SXSW Interactive Jon Lebkowsky and I curated a Core Conversation titled Machines That Tell Stories. I proposed the topic as a book project to Jon last year, and we put together this discussion as a stepping stone. Software storytellers are in the air. There were over a dozen sessions at SXSW this year on storytelling systems, and that kind of consensus usually heralds a new wave about to break. We’ve setup a twitter and tumblr for this project, if you want to follow along. Our argument: Software is moving beyond raw data and into narrative. First it will help you weave the tales you want to spin, but soon it may be telling stories better than all but the best human storytellers. Wired For Story Takeaway: Story is about mechanics, the trappings that you think of as important aren’t as critical as hitting the right beats that resonate with the human brain. Turing in The Imitation Game: The question isn’t whether machines will think like humans, it’s whether machines will think like machines. Why limit to text? Is software that generates a song based on your day’s quantified self data creating a story? We had a great crowd for the conversation, and even managed to be “Hot” in the schedule. Thanks to everyone who was able to make it! This entry was posted in Trip Reports and tagged ai, bots, game design, rpg, stories, sxsw, weavrs on March 18, 2015 by Jeff Kramer. A few days ago a new iOS app called Dreeps landed in my news feed, heralded with headlines like Maybe The Laziest RPG You Could Ever Play and A Video Game That Plays Itself. Dreeps is an app where a little robot boy goes on an adventure, Japanese RPG style. You set an alarm to tell him to rest, and that’s it. When the alarm goes off, he gets up and gets on with his adventure, fighting monsters and meeting NPCs. There’s pixel art and chiptune audio. Dialog is word balloons with squiggly lines for text. It’s all very atmospheric. You just don’t do anything, really, but watch when you want and suggest he get up when he’s resting after a fight. Dreeps is a lot like Godville, a game I talked about in a post about Pocket Worlds back in 2012. They’re games that (appear, depending on the implementation) to be running and progressing even when you’re not around. While Godville does its magic with text, Dreeps has neat graphics and sound. They’re essentially the same game, though. A singular hero you have slight control over goes on a quest. In Godville it’s for your glory (since you’re their god), in Dreeps it’s to destroy evil (I think). Both Dreeps and Godville are passive entertainment experiences, they’re worlds that are all about you, but not really games you play. They’re games you experience, or perhaps we need a new word for this kind of thing. While books and TV shows and music (although not playlists, as we’ve seen with Pandora) are hard to create for just one person’s unique enjoyment, games are great at that. They can take feedback and craft an experience just for you, and as we built more complex technology and can access more external datasets, they can get even more unique. Imagine a game like Dreeps where the other characters (or maybe even the enemies) are modeled algorithmically after your Facebook friends (or LinkedIn contacts). Take their names, mash them through a fantasy-name-izer, do face detection and hue detection to pick hair color and eye color, maybe figure out where they’re from (geolocated photos, profile hometowns or checkins) for region-appropriate clothing. Weather from where they are, or where your friends live, maybe playing on an appropriate map. You could even use street view and fancy algorithms to identify key regional architectural elements and generate game levels that ‘feel’ like the places they live. That starts to get pretty interestingly personalized, though much less predictable. Mike Diver over at Vice posted an article about Dreeps titled I Am Quite OK With Video Games That Play Themselves, where his main point was that he’s figured out that he’s actually bad at games, and it’s nice to have something where you can enjoy the progression without working about your joystick skills. Maybe Mike should spent more time with Animal Crossing, a game series I think Dreeps shares a lot of DNA with. In Animal Crossing your character inhabits a town that progresses in real-time. You can go fishing and dig up treasure and pick fruit and talk to the other inhabitants in your little village, but the world keeps going when you’re not playing, so if you leave it alone for a long time, you come back to a game that’s progressed without you (with the game characters wondering where you’ve been). Dreeps is like that, but without the active user participation. It’s like a zen Farmville. Take out the gamification, add in some serenity. It feels like Dreeps could be a really fantastic lock-screen-game, if that’s a thing. You nudge your phone awake, and see your guy trudging along. He’s always there, in a comforting, reassuring, living way. Maybe Samsung or someone with some great cross-vertical reach could implement lock-screen or sleep-screen as a platform across TVs, phones, tablets, fridges, etc. That’d be something. I was talking to a friend of mine about these kind of games yesterday, pondering where this is headed, and I mentioned that the experience almost feels like an Ecosphere. Ecospheres are those totally enclosed ecosystems, where aside from providing a reasonable temperature and sunlight, you’re a completely passive observer. There’s something nice about walking by and peeking in on it every once in a while. Something comforting about knowing that even when you’re not watching it’s going on about its fantastically complex business without you. But there’s also a spiritual weight to it, because it’s a thing that could cease to exist. I could cover the Ecosphere with a sheet or leave it out in the cold, I could delete Godville or Dreeps from my phone, or have my phone stolen, unable to retrieve my little robotic adventurer. It isn’t a huge weight now that we carry with these sorts of things. In fact, I stopped checking in on my Godville character a few months ago, after over a year of nearly daily care. Sometimes you just lose the thread. But these systems are going to become more complex, more compelling. They’re going to have more pieces of ourselves in them. How would I feel if a friend of mine was a major character in Dreeps, always showing up to help me out, and then he died in real life? What if Dreeps decides to shutter their app, or not release an upgrade for the new phone I get after that? Would I leave my device plugged in, forever stuck at iOS whatever, just so the experiences could keep going? The Weavrs I created for myself back in 2012 are gone, victims to this onward march of technology and unportability of complex cloud-based systems. I’m fortunate that I never got too attached. Droops is an app, but there’s still a lot there outside of my control. I’m particularly interested in where this stuff intersects with physical objects. Tamagotchis are still out there, and we’re building hardware with enough smarts to be able to create interesting installations. There’s an Austin Interactive Installation meetup I keep meaning to go to that’s probably full of folks who would have great ideas about this. Imagine a pico-projector or LCD screen and a RaspberryPi running a game like Dreeps, but with the deep complexity and procedural generation systems of Dwarf Fortress. Maybe a god game like Populous, with limited interaction. You’d be like Bender in Godfellas, watching a civilization grow. Could that sit in your home, on your desk or by the bookshelf, running a little world with little adventurers for years and years? Text notifications on your phone when interesting things happened. A weekly email of news from their perspective? As it sat on your desk for longer, would it be harder and harder to let go of? When your kids grew up, would they want to fork a copy and take it with them? 4 years ago there were no low-power GPU sporting Raspberry Pis or globally interconnected Nest thermostats or dirt-cheap tablet-sized LCD screens or PROCJAM. Minecraft was still in alpha, the indie game scene hadn’t exploded, the App Store was still young, procedural content generation was a niche thing. Now all those pieces are there, just waiting to be plugged together. So who’s going to be the first one to do it? This entry was posted in Tech Futurism and tagged ai, game design, rpg, weavrs on February 19, 2015 by Jeff Kramer. VallisMOO: A Game Designer Is You! The world is a scarred shell of wind and sand and heat. Whoever had their finger on the button finally pressed it. There’s only one safe place left, a tiny, sheltered valley between two giant mountains. To the south is the ocean, to the north, the wasteland. A magical gate keeps the monsters out, and keeps the valley safe. We live well here, in our little sea side town or deep in the forest. We roam the grassy plains, dotted with bald hills. We hunt, and forage, and build. Sometimes we fight, because what’s worth fighting for more than the last good place on Earth? 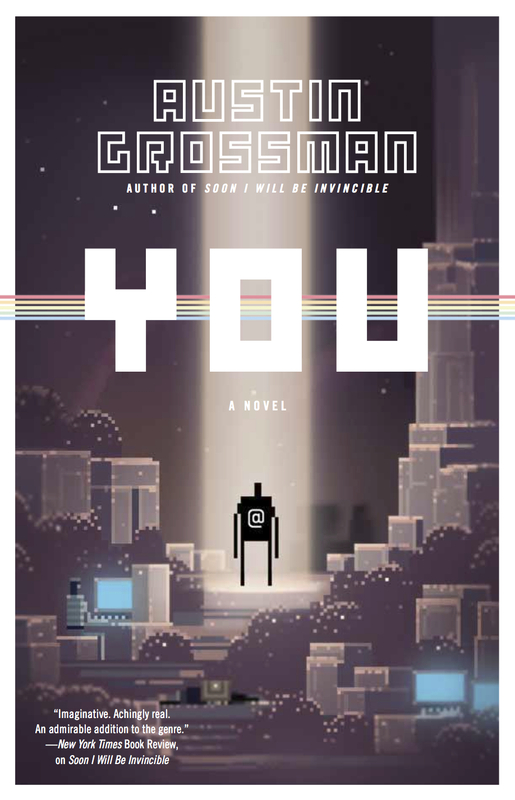 A couple of days ago I read a review of Austin Grossman‘s new book, YOU, by Cory Doctorow, and decided to buy a copy. Austin’s a game designer, and he’s worked on System Shock, Clive Barker’s Undying, Deus Ex, and Dishonored. He’s now an author, with his first book SOON I WILL BE INVINCIBLE, and now YOU. YOU is a book about a directionless 27 year old who gets a job at a game company started by some of his high school friends. While designing a new role playing game, he delves into the mystery of what happened to his friends and their dream of the ultimate game. A game where you could be and do anything, and the story would unfold before you naturally. I haven’t finished YOU, but it’s been bringing up all kinds of memories. I got my first internet account in early 1994, dialing up through Real/Time Communications in Austin. R/T hosted a game, a text-based Zork-ish virtual world game called Ghostwheel, or GhostMOO. I’ve talked about GhostMOO before in my Pocket Worlds post, but I had forgotten an interesting chunk of GhostMOO history, and my own stab at multiplayer game design. My own dream of the Ultimate Game. In 1997 GhostMOO was on the decline. We’d had a big rush of users in 1995, but many of them had graduated from college, and user numbers were down. The two main drivers of the game, Quinn (lead programmer) and Razorhawk (content creator) were busy with other projects, and without strong direction, GhostMOO was stagnating. A couple of GhostMOO programmers, including Matt Sanders (who I’d go on to start Polycot and then join HP Cloud with) and I decided we’d start a spin off. Quinn had been gracious enough to release the core of the game, the bits and pieces that made up combat and non-player characters and monsters, out into the open as the GhostCore, so we had a good place to start. We were thinking of creating a Ghost^2 or Ghostwheel 2.0, if you will. Similar core concepts, but different execution. Ghostwheel was all over the place thematically, we had monsters cribbed from Princess Bride, Alien, a whole community of Dragons straight out of Pern, a quaint japanese island, basically whatever a programmer was really into, they built. Even the name was cribbed from Zelazny’s Chronicles of Amber. In retrospect what we had was a mashup, we were just ahead of our time. Ghost^2 was an attempt to wipe the slate clean, to start with a core concept and theme that would be internally consistent. Like all groups starting with a blank sheet of paper, we wanted to create the Ultimate Game, and we had the audacity to think that we could create a better game than the ones that had come before. We wanted to create a game where if you wanted to play a blacksmith, you should be able to do that all day, role play with other people, and generally succeed and feel progress. If you wanted to fight monsters, great, but that wasn’t the only path. Years later the first Star Wars Galaxies game would do this in MMORPG form, only to be neutered and turned into more of a combat grind in an attempt to compete with WoW. floor is tiled with checkered perma-linoleum; little matching octagons. wall is a queer little potted tree, a tallish leafy husk with a, uh, snout? Obvious exits include down (d, trapdoor) and Up (Helipad, u). Each of these rooms is dug by a programmer from an existing room, like mining through the digital aether. That new room then has an exit back to the room you were in before. (Here’s a map of the main house and grounds of LambdaMOO, for comparison.) That style of design makes for very detailed, interesting areas, but the overall area tends to be small, because every room needs to be described individually. This map defines what kind of rooms there are and what the layout is. In this case the pound signs (#) may be walls, while the tildes (~) may be rivers, and the blank spaces grassy fields. With this lovely hack Quinn transformed the Zork style MOO into a player-perspective Rogue-like. The cool feature of the Terrain Zone is that it only creates the rooms if they need to exist. In a MOO everything takes up memory space, and back in the mid 90’s memory wasn’t as plentiful as it is now. If you’re standing in a terrain room, the terrain zone can look at the rooms around you on the map, and tell you what’s there. “To the north, east and west are open fields. To the south is a stone wall.” Those rooms don’t actually exist. Once you decide to walk north, the Terrain Zone creates that room, moves you into it, and destroys the room you were standing in before (unless you dropped something, or there’s some other reason for the room to still exist). 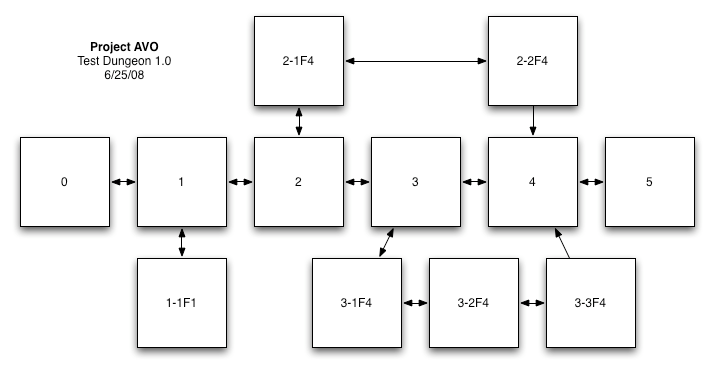 By operating like this you could create huge areas without actually digging and describing every room yourself, and the memory consumption would be a lot smaller. Your monsters and other non-player characters could also know about their “home” terrain type, so they wouldn’t stray from the grass or river. You could also let the player “travel north” and they would keep walking through rooms until they hit a room that was different than the type they were already in, or contained something unique. The map is 1,000 pixels by 1,000 pixels, so our game would would be 1,000 rooms by 1,000 rooms. In the orange spots where there were towns we could dig out special rooms for houses and buildings, we could dig out special dungeons from the fields or forests. In this map light green is grassland, dark green is forest, gray-green is hills, blue is water, yellow is roads, and grey is rocky terrain. The outlines around large sections are edge types, like the edge of a forest, a beach or the base of a hill. It was a really cool concept, and thinking about it still gets me excited. The idea of adventuring in that world, exploring the bustling cities, verdant fields, dark forests and dimly lit caves sounds like a lot of fun. Game design isn’t easy. It’s easy to dream about, but it’s hard in practice. I’m about 1/3rd of the way through YOU, and the main character’s starting to realize that he has to enumerate every kind of object in the world, in every state it has. We reached a similar place with Ghost^2, which eventually became VallisMOO when interest waned among the other developers. We decided not to create a sister-MOO to Ghostwheel and I kept working on my own, and that MOO became VallisMOO. I appreciate the stamina exhibited by the Adams brothers, the team behind Dwarf Fortress. They’ve been working on that thing for years, but that level of dedication is really hard to maintain. I got to a place with VallisMOO where I needed to begin populating the combat system with weapons. I heard that Steve Jackson games was working on a Low-Tech book, due out “any day now”, and instead of forging ahead (ahem) and making do, I decided to wait till it came out, and use it for reference. That was 1998. GURPS Low-Tech finally shipped in 2002, and by then I was on to real paying projects and VallisMOO was only a memory. I went digging through my project archive and found a directory full of VallisMOO code and to-do lists and graphics. It even had some logs of conversations where I discussed the ideas for Ghost^2 with some friends, things I’d long forgotten. I thought I’d share the design documents with the world, so I’ve uploaded them to github with a Creative Commons license. There are files of character types, races, locations, maps and all kinds of crazy things. If you thought this post was interesting, and enjoy 90’s era game design, you’ll probably really like Austin Grossman‘s YOU. I finished it last night, and once I get a chance, I’ll write a more complete review. This entry was posted in Project Retrospectives and tagged game design, moo, rpg on April 22, 2013 by Jeff Kramer. Back in 2008 when I was a managing partner at Polycot, we had an idea for a Facebook game. I’ve always loved the spy genre, and it didn’t seem well represented, so we spent a few months of idle time writing up specifications, prototyping screens and mapping out how the application would work. After it became obvious we didn’t have the budget to develop or launch the game, we shelved the project. In the spirit of sharing ideas, here’s a glimpse inside the first phase of a game project. Our design theme was inspired heavily by the early Bond films, the Flint films, Get Smart, and the fantastic game No One Lives Forever. The spy genre gives us a nice set of tools to make a game with. There’s a spy (the player), bad guys and traps (obstacles), cool items (inventory), and exotic locations (setting). I’d played a lot of Kingdom of Loathing, which has a similar set of elements, though KoL is an extremely silly parody of the fantasy genre. We wanted AVO to be wry and funny, but not silly. Like NOLF in theme, but KoL in experience, if you will. When you’re developing a game you have to think about how people will play, and design a game to suit it. Facebook games need to be playable in small chunks, though you may have a lot of time to burn, not everyone does. 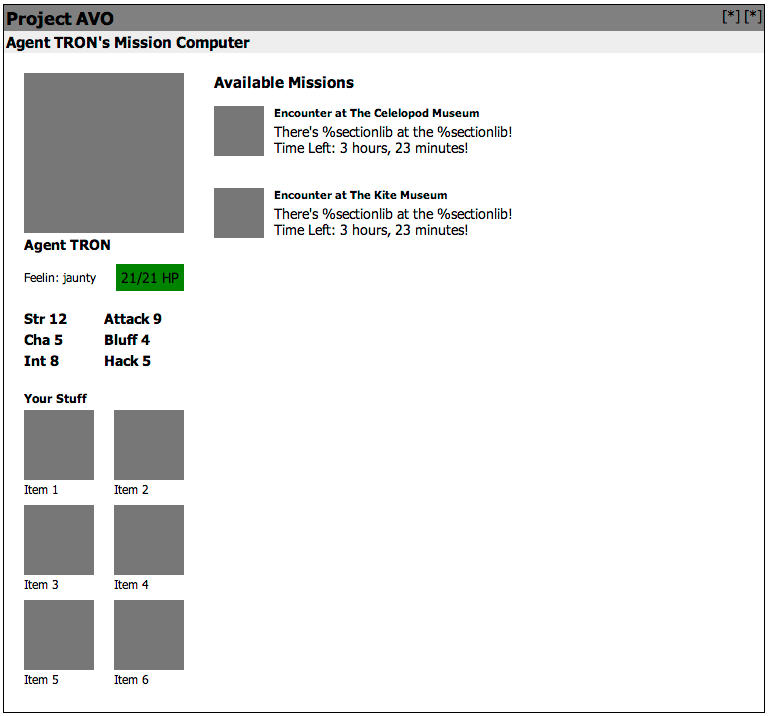 We wanted a game you could play a mission or two of over your coffee break, and feel like you’d accomplished something. We had three classes in the game: Muscle, Tech and Spook. Tech characters would be able to crack security systems and take shortcuts while spooks would be able to use disguises or sweet talk their way around bad guys. Muscle characters would just fight their way from one end to the other. You’re standing in yet another hallway. Marble columns arch from floor to ceiling evenly along the length of the hall. Security cameras sit high in the corners %instance_variable. The floors are spotless, shining in the glow of incandescent lamps set into small alcoves. A threadbare rug extends the length of the hall. Assuming this was a Cephalopod Museum, into that we would substitute an instance variable like ‘above seashell sconces’ and the roomlib title would be ‘an angry-looking octopus’. Those who have money do art, those who don’t have money do text. Fortunately with layered graphics we figured we’d be able to create generic room backgrounds and then drop unique sprites on top of them as we had money to pay artists. The rooms would be populated by thematically appropriate bad guys, and to proceed through the room you’d need to defeat or incapacitate them. You’d get equipment for completing missions or helping out your friends, so you’d have leveled guns or grenades or disguises, if you were a spook. Get through all the rooms and you successfully complete the mission. As a Facebook game, you need to limit the amount of content and progression players can burn through in a sitting. Otherwise, assuming your game is fun, they’ll burn through all your content in one sitting and then be done with it. We planned on doing that by limiting the missions available to players. We’d have low-value missions available regularly throughout the day that were only available for a set time (like the next 3 hours), and daily missions that were high value that were available all day. You’d be able to help out your Facebook friends who were playing the game by sending them access to mid-value missions. We also had the concept of multi-player missions, so the reward wouldn’t unlock unless all of the players who agreed for the mission completed it within the set time. Since we were allowing good guys and bad guys, you’d also be able to PvP with other players, though we didn’t prototype that too heavily. Over time you’d level up, gaining the ability to go on multi-player missions, go on missions in cities other than your home city. We’d differentiate cities with unique areas and unique variables, so Paris might have a Stinky Cheese museum and cathedrals while Los Angeles might have a Plastic Surgery Parts warehouse and movie sets. In the end we didn’t get beyond a simple web demonstration without enemies that Ethan built in rails. As a consulting shop we’d have had to finance it with profits from other projects, and since everyone had bills to pay, those profits never stayed around for long. Not having a graphic designer on staff also meant we’d have to pay other folks to do a lot of work, which became a major stumbling block. We probably could have repurposed this idea for an iPhone game, but by the time that platform was ripe we had other ideas to try. I’ve uploaded a bunch of design documents to github, if you’d like to check out more. Maybe someone will take the idea and run with it. It’s still a game I want to play. This entry was posted in Project Retrospectives and tagged dungeons, facebook, game design, rpg on February 23, 2013 by Jeff Kramer. Most gamers I know tend to collect unplayed games. We buy them with the greatest intentions, but then they sit, unplayed, often unread. Fiasco is a great game, a collaborative storytelling game about people with powerful ambitions but poor impulse control. We finally got to play it tonight and had a great time. For your enjoyment, here’s a rundown of our little adventure in Beatrice, Nebraska. It was a real fiasco. 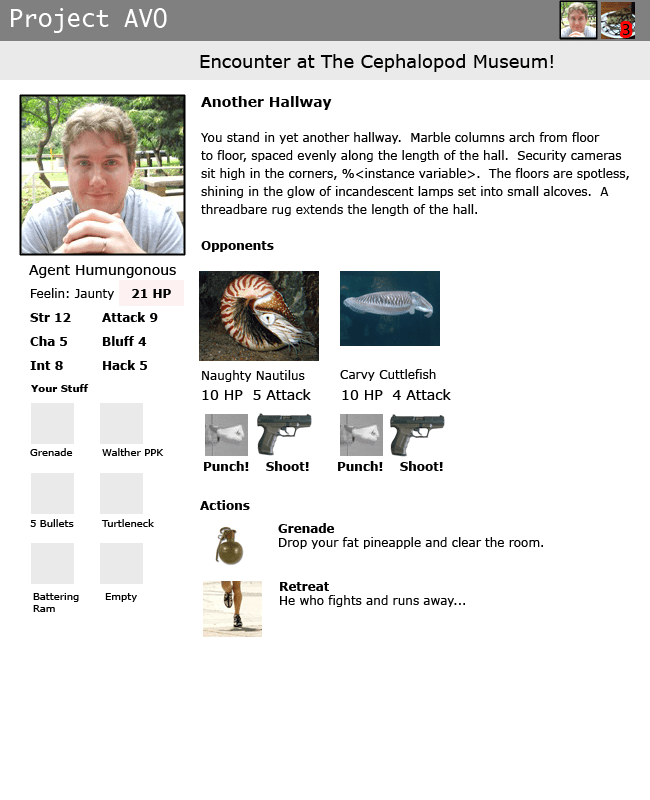 This entry was posted in Reviews and tagged fiasco, game design, rpg on January 16, 2013 by Jeff Kramer.